To read part 1 of the interview with Dan Mills, visit here. Christina: In 2009, your series of thirty-five maps titled US Future States Atlas was published by Perceval Press. Discuss the political, social and cultural events that led to the creation of this pivotal work. 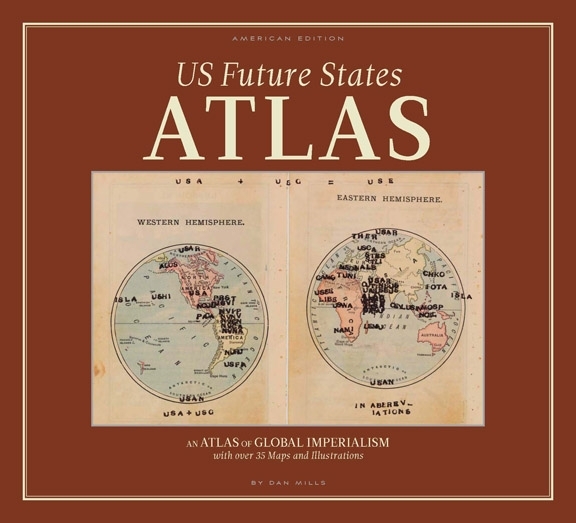 The work itself: The US Future States Atlas was started after we went to war with Afghanistan and before Iraq. From the initial global response to the terrorist attacks of 9/11 and how our leaders turned what was initially a supportive “we are in this together” outpouring from most of the global community to more of an “if you’re not with us you’re against us” approach to diplomacy, and to determining military actions based not on facts but rather on deciding actions and then searching—or fabricating—for corroborating information to support these decisions, etc…this poorly conceived approach, where this would lead us in war and diplomacy…these were the catalysts to this work. Christina: Your work for the concurrent exhibitions Quest at Zolla/Lieberman Gallery and US Future States Atlas & Related Material at the Chicago Cultural Center continued to evolve based on the US Future States Atlas. How did the ideas and artwork progress and develop in the last year or two leading up to these seminal exhibitions? Dan: For Quest, I worked on a number of small and mid-sized works on paper, and five larger works. 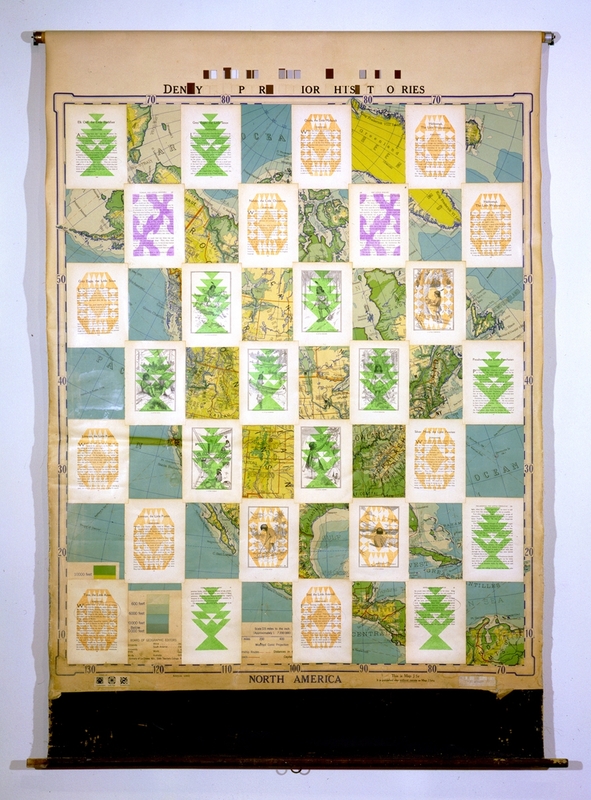 After moving to Maine in fall 2010, I spent a year painting on small maps, approaching this using different media—watercolor, acrylic, ink—and different conceptual and visual strategies. I also revisited making work on/with schoolhouse maps, this time laying them down on gessoed board. 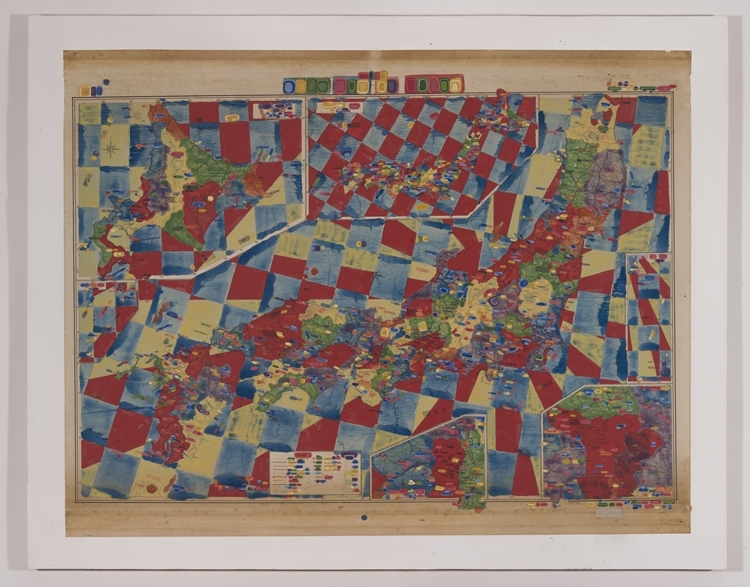 When the Chicago Cultural Center offered me an exhibition, the exhibition that developed, US Future States Atlas & Related Material, provided me an opportunity to show the “Atlas” in Chicago, a place important to me and where my formative years as an artist and curator were spent (1981-94). Adding the related material was my way to also include supplemental materials to the Atlas, namely a number of United States Empire (USE) Ambassador Documents. 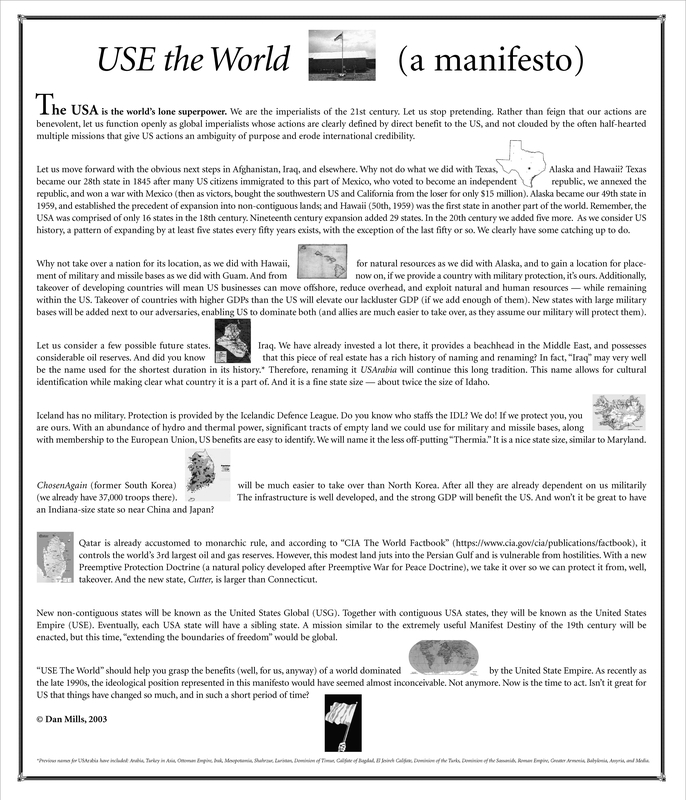 Christina: In the Chicago Culture Center exhibition is a copy of your USE the World: a manifesto. Tell me a little about the thoughts leading to this manifesto. Christina: One stark contrast between the two exhibitions is that approximately 10,000 words are embedded in the art at the Chicago Cultural Center, but ZERO words are in the work at Zolla/Lieberman Gallery. Why did you decide to include a volume of written word in one show, and an absence or silence of written word in the other? Dan: This was exciting and fascinating to do simultaneously. 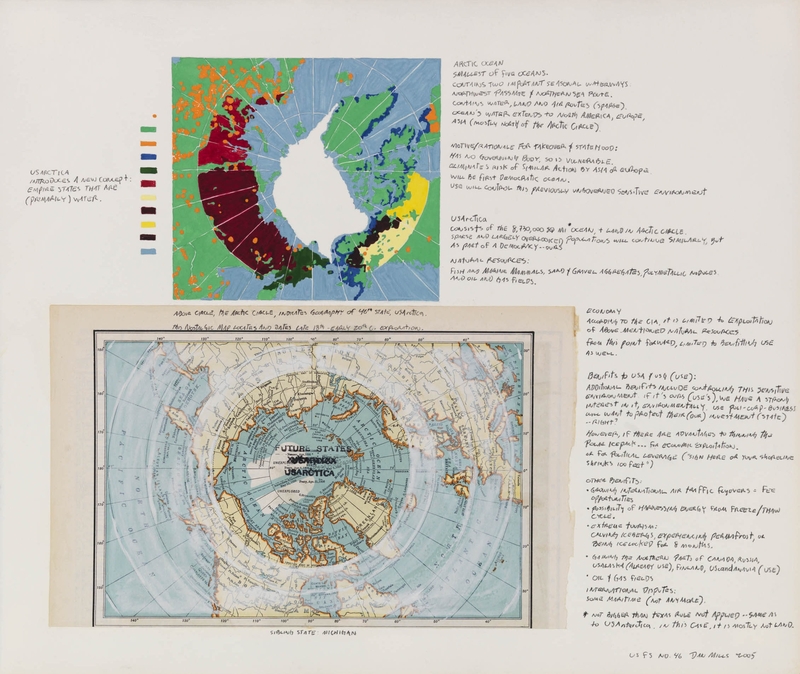 Much of the CCC show focuses on the Atlas, which in its entirety is comprised of 35 works on paper that on average have 200-300 word text hand written in them. 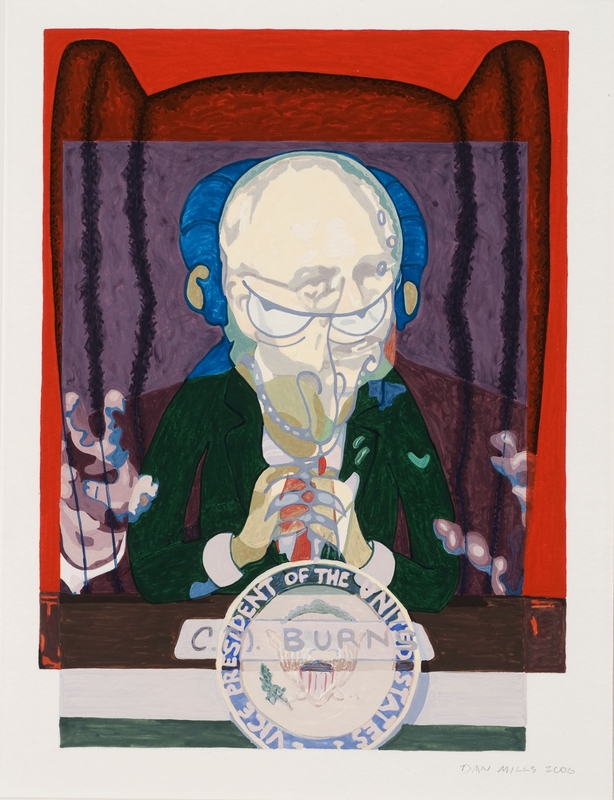 Each work has some facts about the new “acquisition”; motives and rationale for takeover and statehood, and usually some darkly humorous aspect of this takeover, and part of the grand narrative that exists throughout the Atlas. Additionally, the Manifesto, 74 Ambassador Documents, and related correspondence are in the show. While not necessary for someone to read it in its entirety, the act of selectively doing so makes the viewer have a good sense of the rest (although I love knowing the occasional viewer actually does read everything). Meantime, Quest is employing a strategy of removing text and its meaning. After all, historically, colonialism and imperialism have been as much about erasing history as writing new history, no? So I developed various strategies to do this: certain colors marks, frequencies, were chosen by the letters beneath them. No longer readable, what existed beneath significantly determined the outcome of what is seen. This is even true with the Artist Statement. 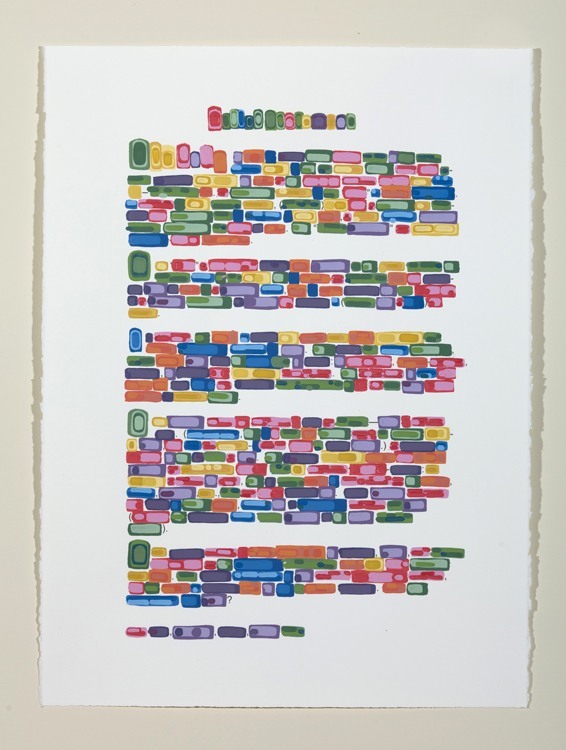 After writing it, I transferred it onto the 22 ½ x 30 inch Arches watercolor paper and painted the words out applying the same strategies used in the other works. But I left the punctuation. Christina: Those who know your artwork are curious about the “rules” you have created for your embassy and inclusion of members. Can you give us a sneak-peak into how these rules were set? Dan: I essentially applied some of the same time-tested methods for such appointments: quid pro quo, favors, money, and nepotism are some of them. Viggo Mortensen, Leah Ollman and Eleanor Heartney were offered embassy positions, as were Gail Skudera (artist and Mills’ wife) and our children. And so were crate builders, frame-makers, people who helped me unload a truck returning from an exhibition, artists who I’ve exhibited this work next to, etc. Recently I started creating aspirational quid pro quo offers—people associated with institutions I would like to have an association with: large museums, curators and directors. We’ll see who wants to be part of the staff, help the cause. 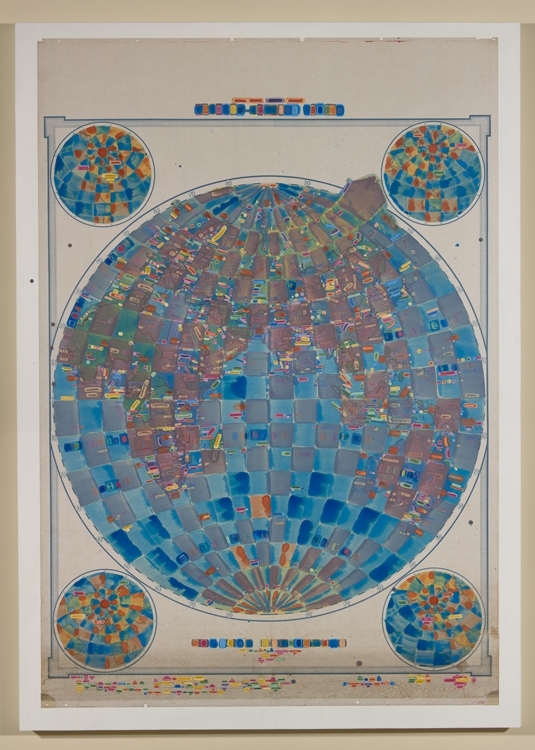 Also, posthumous offers have been made, to artists important to me in my formative years as an artist and whose work continues to inspire me, such as Öyvind Fahlström, Alighiero e Boetti, and Marcel Broodthaers, and also some imaginative eccentric mapmakers such as Walter Trier and Heinrich Bunting. 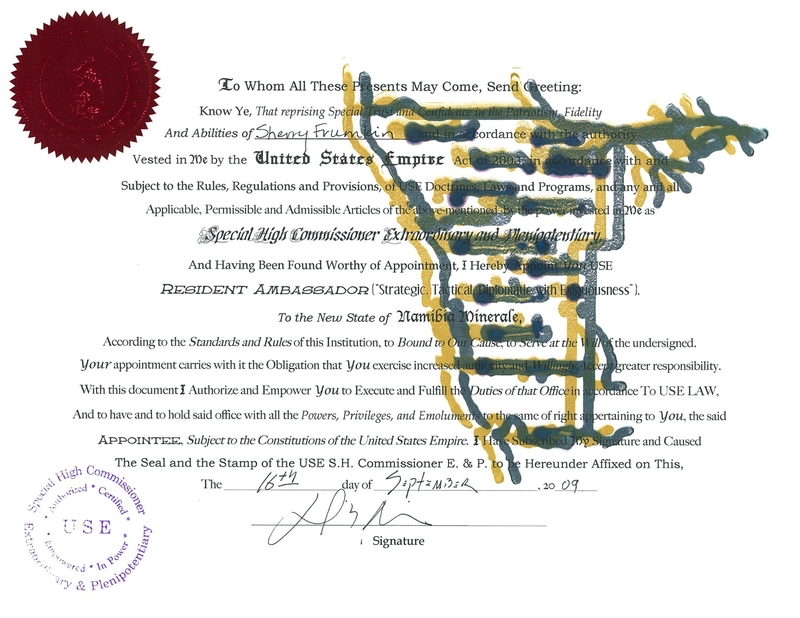 The document borrows over-the-top language from sources as varied as confederate US presidential documents to Tai Kwon Do certificates of achievement. And each includes prints of the new state the position is offered for, and the official seal and stamp. 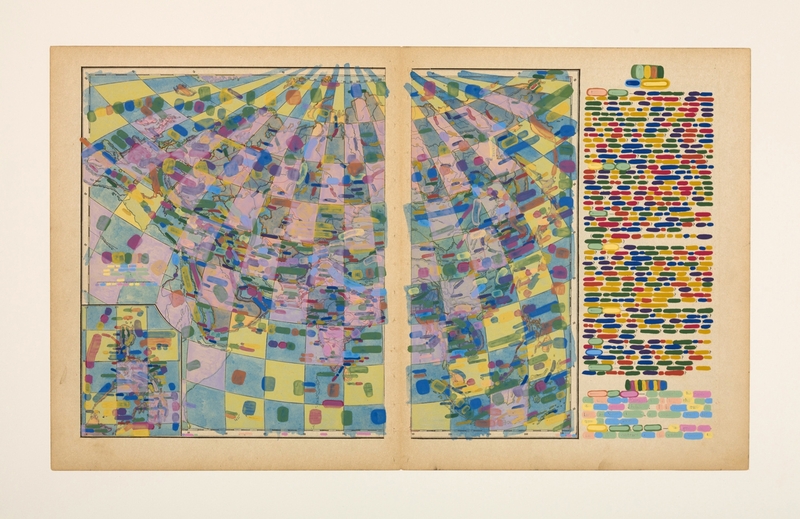 Dan Mills: Quest, Zolla/Lieberman Gallery,Chicago, through 8.25. 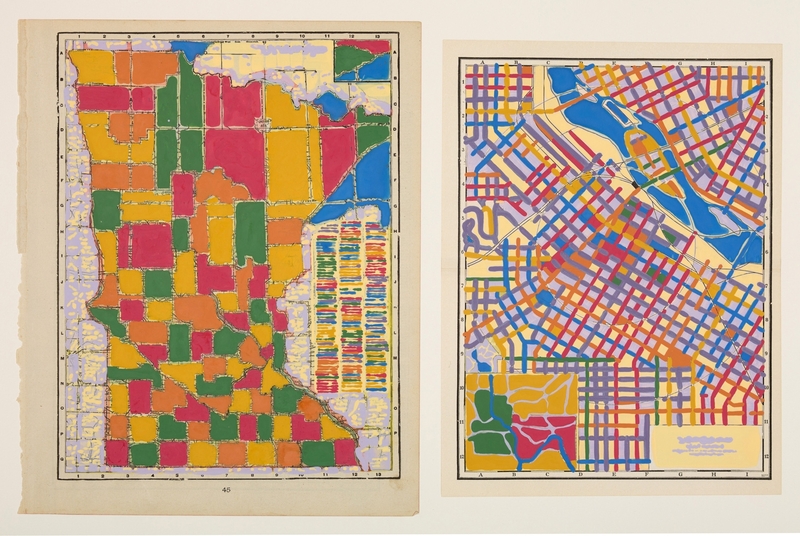 Dan Mills: US Future States Atlas and related material, the Chicago Cultural Center, through 9.23. View more of Dan Mills’ work on his website. I met Dan Mills early in my undergraduate college career when he was the Director/Curator of the Gibson Gallery at State University of New York, College at Potsdam. Dan has been creating art for over two decades, making multi-media works that comment on current and past political and social events. Recently, I caught up with Dan at the cusp of concurrent exhibition openings at the Chicago Cultural Center and the Zolla/Liberman Gallery Chicago. In part 1 of the interview, we discuss his earlier works. Christina: Dan, you have been creating art for twenty-five years. Talk a little about the progression of your work over time, and about the basis for your ideas. 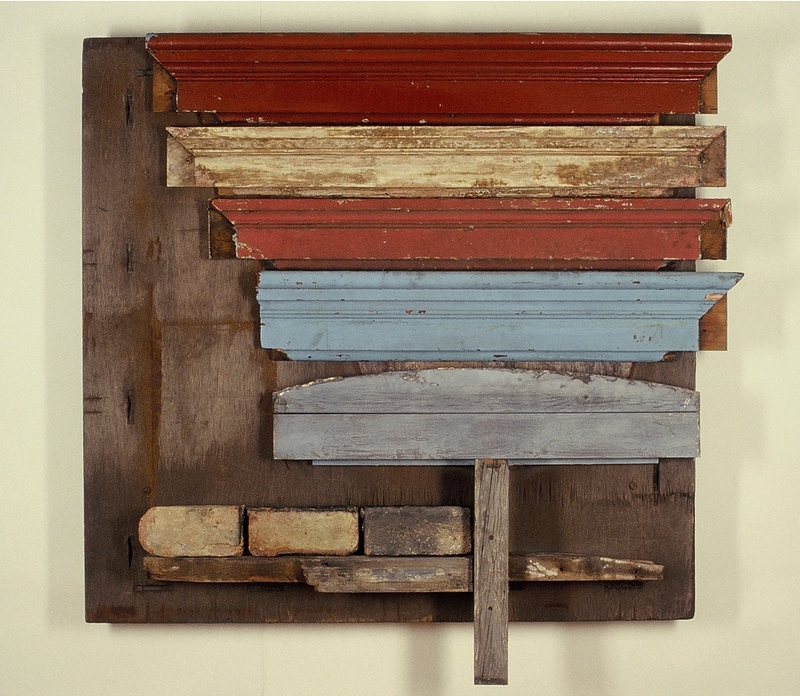 Dan: When I moved into Chicago in the early 1980s, I was essentially creating three-dimensional paintings. I had attended graduate school at the School of Art at Northern Illinois University, and feel fortunate to have been there at a really good moment, one filled with significant experimentation, many smart and creative peers, and when many of the faculty were very active as artists, exhibiting and engaged with the Chicago art scene. Anyway, the work I began making was painted found object constructions, and I gathered the materials from buildings that were being gutted or demolished in both distressed and gentrifying neighborhoods. Initially, the work focused on forms derived from rural vernacular architecture. I was an art mover at the time and was driving throughout the Midwest and becoming attuned to its distinct structures and landscape and palette, which were quite different to someone who grew up in the Northeast. After investigating and developing a process for this visual and material/construction vocabulary, I turned my interests to the source of the materials—urban buildings. My interest turned more and more to thinking about the anonymous history that had taken place in the modest buildings that were the source of my materials. These were quite successful, I think, were exhibited extensively, and collected in Chicago. One of the culminating works was Homage to Mopetown, a construction made from materials gathered from the last remaining house in a south side neighborhood that had been zoned out of existence, with blocks being replaced by large municipal projects such as highways, rail lines. The brick side of the house had fallen, exposing the apartments inside. 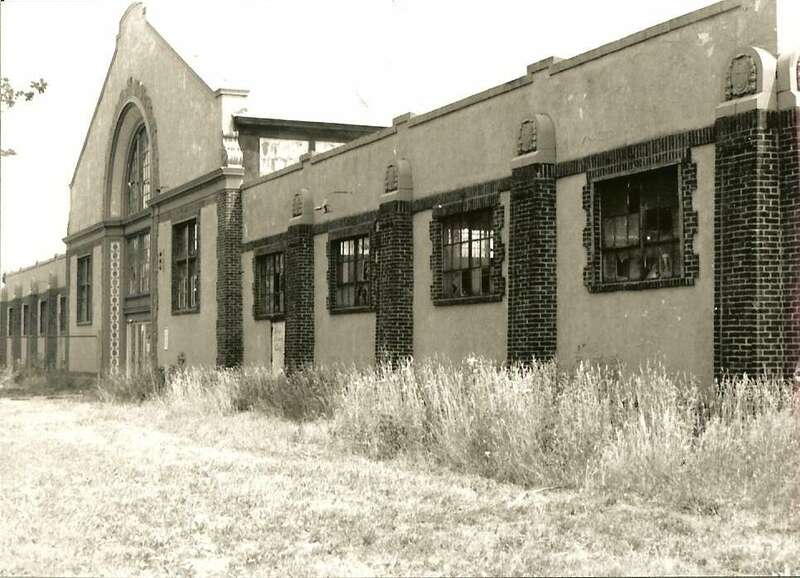 The wood and bricks were gathered from the building. By this point, I was no longer painting glazes onto the constructions, a process I had used to formally unify the constructions. So my interests had evolved, to thinking much more about ideas including gentrification, displacement, and the lives lived in the building sites that were supplying me with raw materials, than the earlier more formal and architectonic interests. Around the time of the Quincentennial of…insert euphemism here…The First Encounter, The Discovery of the New World, Columbus’s Discovery of America, I began incorporating collage into my work, and quickly found that this process of adding a new and potentially more specific vocabulary of found material into my work worked well with my interests. So at a time when I was thinking a great deal about the meaning of this anniversary, and so much of the discussion around it—which often omitted history in favor of political positions. I began to read a lot about this, and began to make work that was my way of investigating these ideas. 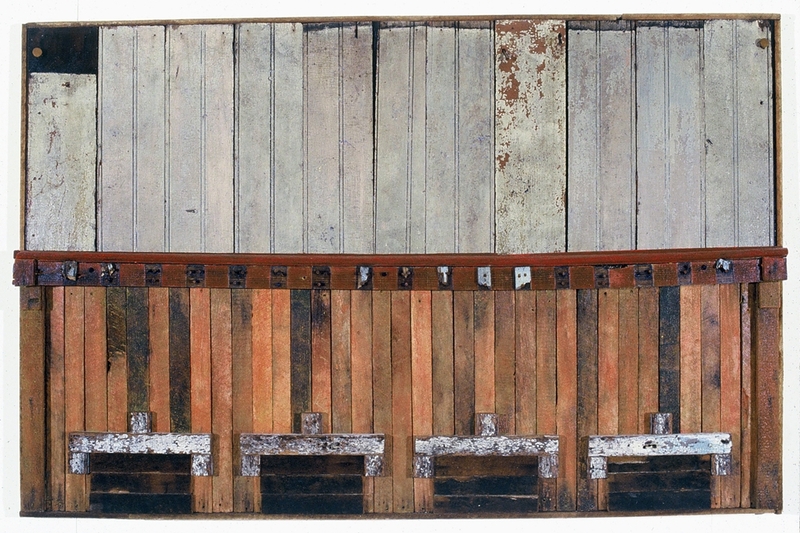 (Re) View (1492), 1992-93, collage on wood, 20 1/2 x 52 x 2 1/4″. From that point on, the work became my way of making sense of the world around me, historic and current, and became my way to comment on this, critically and sometimes with humor. 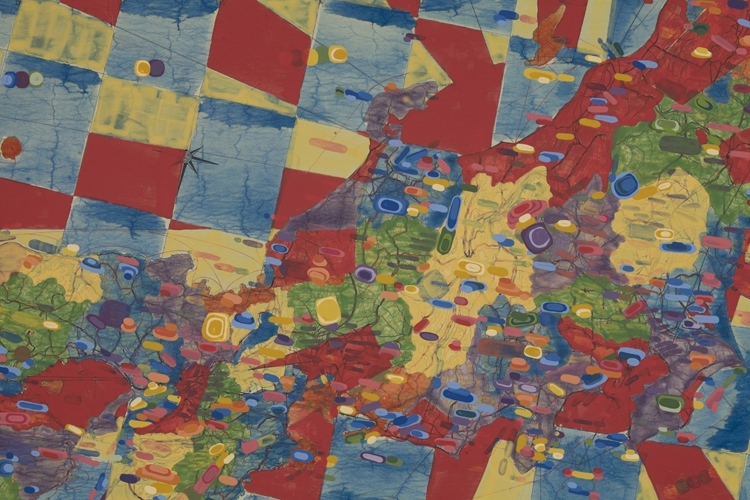 One particularly successful series is the Map Paintings, which thinks about imperialism and colonialism, and are paint and collage on roll-down schoolhouse maps. Many works since this time employ, are made on or with maps. Christina: Your work is largely based on political events nationally and internationally. Explain how events of the time resulted in your series Morphs (2005) and American Icons (2005-2007). Dan: This is true. Beginning in the early 2000s, much work from this time was responding to our government’s global and military actions and its ways of negotiating with other countries in the world. 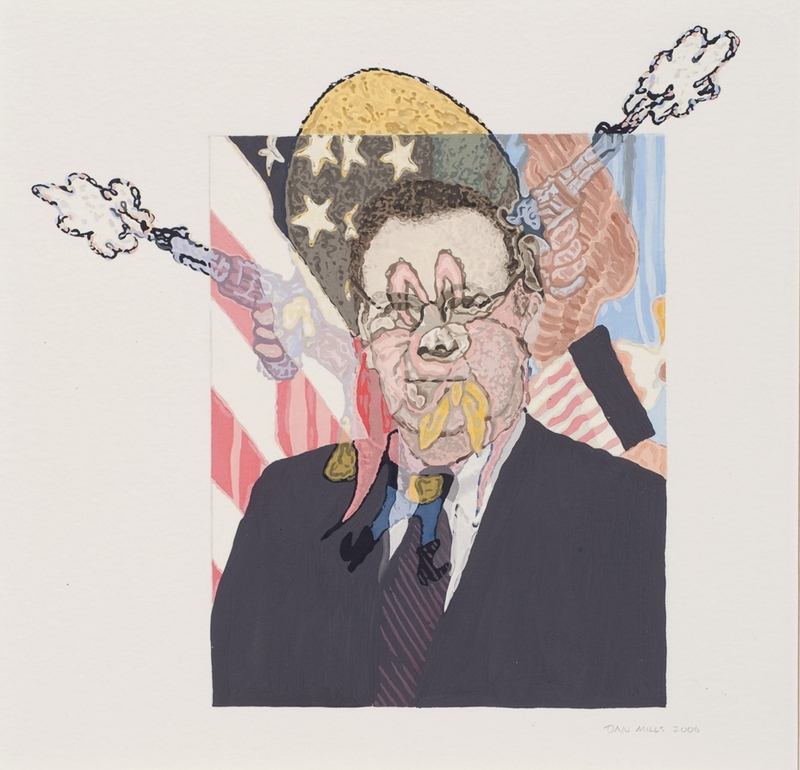 The American Icons is a series of watercolors that visually combine political figures and their (unflattering) cartoon or comic alter egos. I spent considerable time thinking about what fictional character best embodies some of the characteristics of the political figure. I think of them as archetypal images; art/political cartoon-images that will represent the era for years to come. The Morphs are 8’ long paintings that transform a map/symbol of the US into various other symbol forms that seemed appropriate to the time: an assault rifle, attack helicopter, and eagle. The eagle is not one of the more stylized and benign eagle symbols commonly used now, but looked back to the early 19th century when we depicted the raptor more naturalistically, as a muscular bird with more aggressive talons and beak. These and other works of this time continue my approach—making sense of the world around me through my work—but with a specifity not seen previously. Working this way risks having one’s art not stand the test of time, I suppose, but if it’s strong work, my thinking is that it does, and as time passes, it also represents a way of thinking at that time that, too, becomes historic. In part 2 of the interview we will discuss Dan’s recent works and exhibitions at the Chicago Cultural Center and Zolla/Lieberman Gallery, Chicago. Once a month, we invite you to take part in ArtSMART. 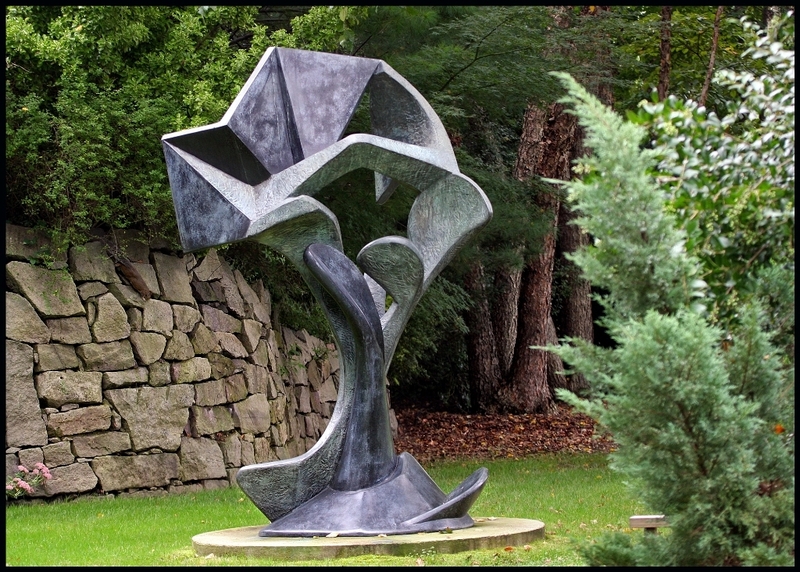 Be the first to answer a question correctly and win two guest passes to Grounds For Sculpture. You may answer the question by commenting to this post. At Grounds For Sculpture, what state fair relic was the sculpture pad built upon? 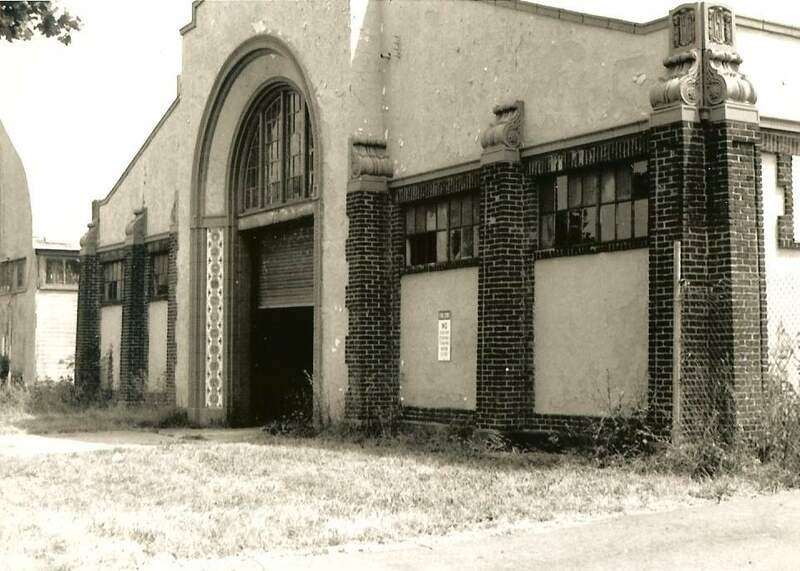 My first encounter with the New Jersey State Fairgrounds was in 1969. My parents had never taken me to the State Fair as a child, and when my girlfriend Becky heard this, she insisted that we go. She said that I had obviously had a deprived childhood, and that the State Fair was an experience that was not to be missed. I was twenty. She was seventeen. We were sort of fledgling hippies in a Princeton kind of way. 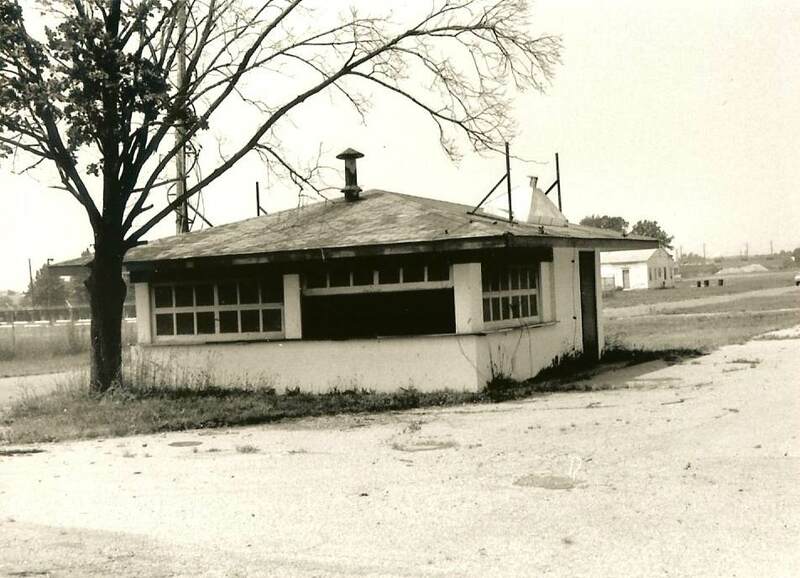 A hot dog stand at the New Jersey State Fairgrounds, ca. 1982. I have to say, I was more than a little apprehensive about this proposed venture to the Fairgrounds. Trenton in the late sixties seemed a cyclone of anger, instability, and racial tension. Add in an array of carnies, motor-heads, hill-rats, and the bib-overall set, and this did not sound like a place where young pseudo-hippies were going to be made to feel welcome. I was not exactly envisioning an evening in Kansas filled with carousels & cotton candy. I arrived at the Midway with trepidation, and I was not disappointed. It was like running a gauntlet of sneers, jeers, leers, and stares. At the end of the night, I was less than inclined to return to the Fairgrounds, and I would not return again for another six years. 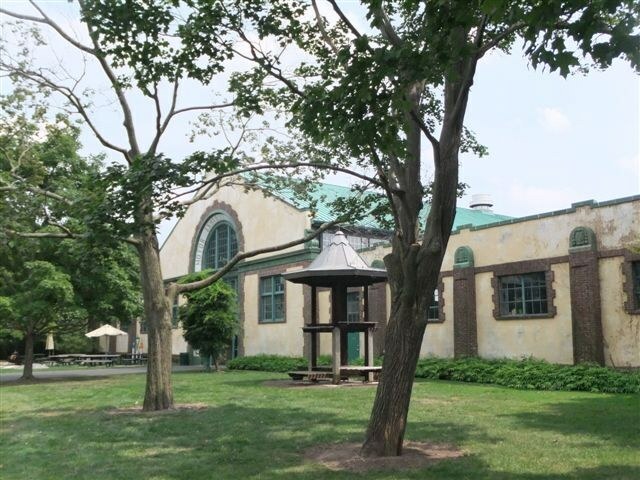 In 1975, I was working at the Highfields Residential Group Center in Hopewell. I had finally graduated from college (after eight years of off & on), was enrolled in graduate school (what was I thinking? ), and had a full-time job working with juvenile offenders. My work schedule was constructed around my class schedule, so for a number of years I worked the Saturday night shift. I loaded up a green State of New Jersey school bus, and shepherded fifteen to twenty adolescent males out into the community for shopping and recreation, trying desperately to keep the level of terror inflicted on the local towns to a minimum. Think about managing a group of 15 to 18 year old juvenile offenders on their one night a week out in the world, and you can imagine how that usually went. Motor Exhibition Building, ca 1982. Then the assignment came to take the residents to the New Jersey State Fair. I was not exactly thrilled. And it went about as well as I anticipated. We entered through the Motor Exhibit Building. But ten o’clock eventually came, and every last one of them straggled in under the Maple tree. Enough of my rules had apparently been followed that none of them had been arrested. Domestic Arts Building, ca. 1982. The place was a ruin. The grass was above my knees. The buildings had been abandoned. Their windows were broken. The doors were ajar. I walked inside. There were pigeons and their droppings, everywhere. There were piles of trash and debris. People had been crowbarring off decorative tiles & terra cotta. The lakefront was a public beach. My anxiety level skyrocketed. This time it was not just a Saturday night. This was my new job. This looked a lot like a long term relationship. Now, nearly thirty years later, I sit here at my desk in the Motor Exhibit Building, thinking about my initial encounters with the Fairgrounds. Ghosts of the rowdy midway flicker through my brain. I look out the window at the same Maple tree that I once gathered the Highfields residents under. It’s been struck by lightning recently, and had its damaged limbs cut away. Yet the peacocks continue to roost on what remains, and the garden that I’ve helped to create moves in the evening wind. 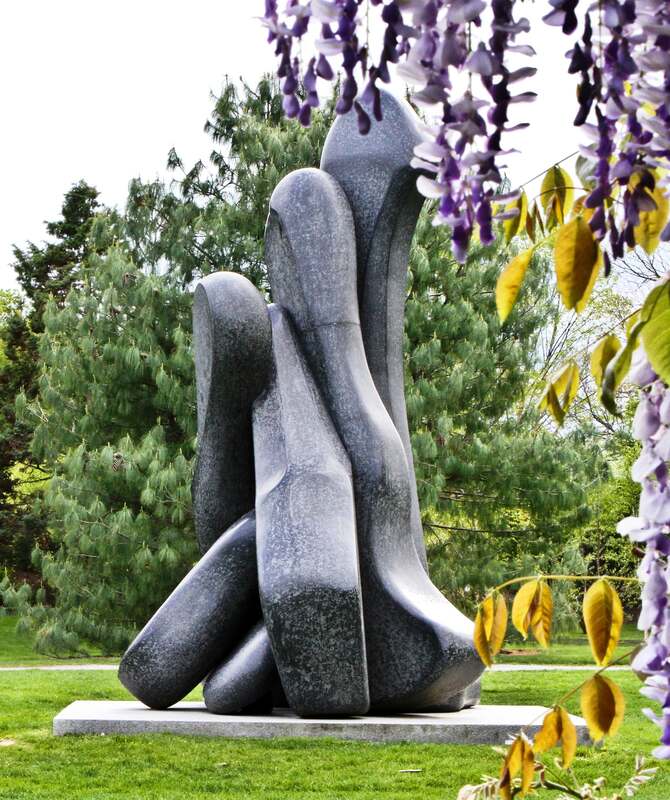 Gyuri Hollosy is an exhibiting artist at Grounds For Sculpture, where his sculpture Kathy B is on view near the lake. Recently, David Burchell interviewed Gyuri in his New Jersey studio, focusing on a sculpture Gyuri has created as homage to the late Isaac Witkin. Gyuri also discusses his other work and a series of sculptures which can be moved, transforming the pieces into what appear to be new works. Watch the interview here. Mr. Witkin was a prolific artist, creating works in bronze and stone. 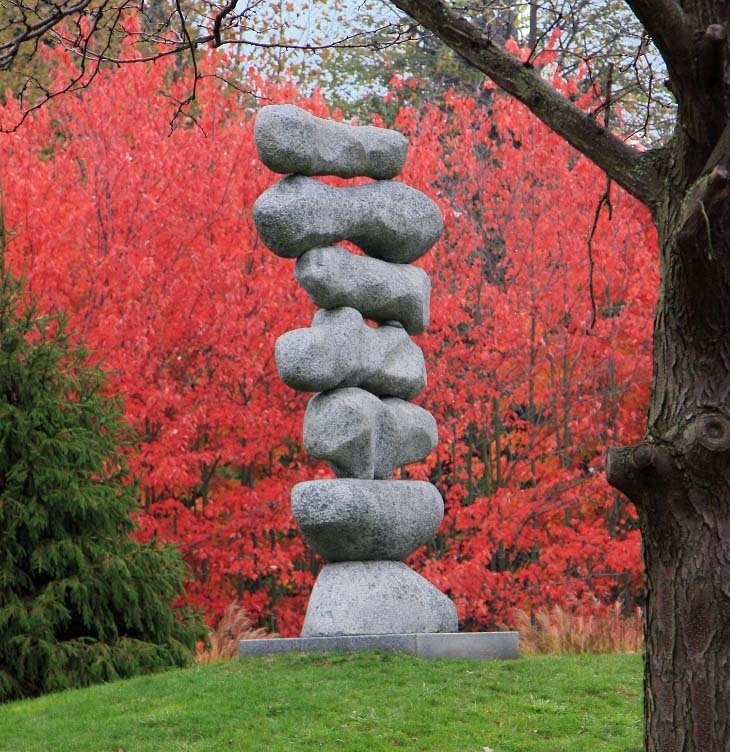 Several of his sculptures are on exhibit at Grounds For Sculpture, as seen below.